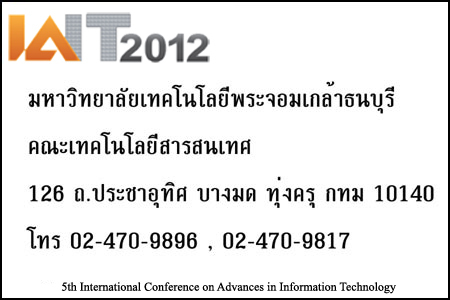 The venue for IAIT2012 is at School of Information Technology, King Mongkut's University of Technology Thonburi, Bangkok. The IAIT2012 provides a shuttle van for the authors and attendances at the Anantara Bangkok Riverside Resort & Spa http://bangkok-riverside.anantara.com/location.aspx which located on the west bank of the Chao Phraya River, Anantara Bangkok Riverside Resort & Spa is roughly 45 minutes from Suvarnabhumi International Airport. 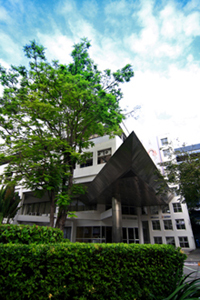 Anantara's Bangkok river hotel is a short 20 minutes boat ride from Saphan Taksin skytrain station http://www.bts.co.th/customer/th/images/area-map/S6_update.gif, a convenient connection to all other locations within the city. The boat transfers are complimentary and depart from Saphan Taksin and the resort every 20 minutes.